Americans choose real estate and not gold as their number one pick for long-term investing, according to a poll by Gallup run in April. Gold was last year's top investment choice at 28% while real estate was just 20%. Now only 24% of Americans like the yellow metal while real estate eked out the win with 25%. The other investment choices on Gallup's annual Economy and Personal Finance poll were stocks/mutual funds at 22%; savings accounts/CDs at 16%; and bonds at 9%. Note that the poll was conducted before the big pull-back in gold prices in mid-April. Americans 50 and older still rank gold as the best investment choice. People with higher income favoured real estate as an investment vehicle compared to the rest. Real estate is making up lost ground. When Gallup ran this poll in 2002, 50% of American said real estate was the best investment. Stocks were a distant second at 18% and gold was not even on the survey. While gold is getting hit, real estate is perking up. According to the National Association of Realtors, existing home sales in January were 12.3% higher than a year earlier. The association also said that inventory—the number of properties for sale at a given time—was at the lowest level since April 2005. Poll question: "Which of the following do you think is the best long-term investment–[bonds, real estate, savings accounts or CDs, stocks or mutual funds, (or) gold]?" 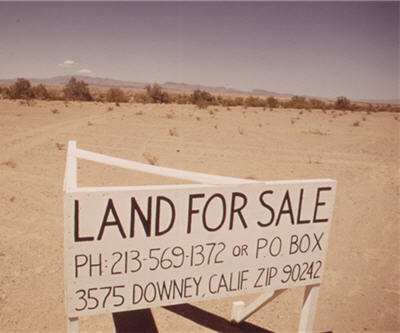 Image of desert real estate by The U.S. National Archives. Chart from Gallup.